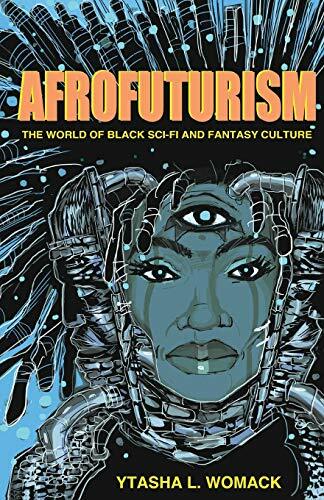 Ytasha L. Womack's Afrofuturism: The World of Black Sci-Fi and Fantasy Culture provides a lively introduction to an important black aesthetic. Womack's subject is the creative output of a diverse group of artists: they are "[v]isual artists, graphic artists, musicians, poets, DJs, dancers, writers, and filmmakers," and all employ "black characters or aesthetics to deconstruct images of the past to revisualize the future" (p. 22). The "Afro" in Afrofuturism is Africa and the African diaspora; the "futurism" is an expressive mode concerned with imagining a viable black future. Womack's use of the word "revisualize" indicates Afrofuturism's oppositional stance: in a world crammed with negative images of black people, cultures, and history, Afrofuturistic artists strive to see the world over again, to read it differently. They reread the signs, repurpose them, remix them, refuse them, and recreate them. The term "Afrofuturism" was coined in the 1990s by the cultural critic Mark Dery, who recognized a preoccupation with the future in the work of a number of black artists, and wondered, at the same time, why so few black authors wrote science fiction. In Afrofuturism , Womack answers by taking a broad view, which includes not only artists producing in the time since Dery's piece was published, but also those who emerged long before Afrofuturism had a name, such as the early twentieth-century poet and fiction writer Henry Dumas. Womack's range is impressive. She considers over a century of art in a variety of media, from the writings of W. E. B. DuBois to Janelle Monáe's Electric Lady album. She gives ample space to women artists (something that's lacking in some core works on Afrofuturism, such as John Akomfrah's otherwise excellent 1996 documentary The Last Angel of History ). She advances an understanding of the aesthetic as flexible and multifaceted: for Womack, Amiri Baraka's concept of Afro-Surreal Expressionism, and the hauntings of Toni Morrison's Beloved , deserve a place in the constellation of creative endeavors that, together, make up Afrofuturism. The aesthetic emerges as a "fuzzy set"—a concept that's been extremely useful to fantasy and science fiction critics. Afrofuturism can be as spectacular as George Clinton's Mothership landing onstage at a concert, or as subtle as Grace Jones's hair. And it works. If you listed the individual pieces and performances considered in Afrofuturism , the result would sound pretty haphazard, but it doesn't read that way, because Womack has an excellent eye (and ear) for the aesthetic. It's not clear at first glance that Afro-surrealist poet D. Scot Miller, jazz artist Sun Ra, and rapper Missy Elliott have anything in common, but Womack brings hidden lines of connectivity to the surface, revealing a shared set of interests: a preoccupation with experimentation, with the strange, with the soulful, with black history, with black imagery, and with a black future. The book is arranged thematically to make the connections clear. Themes include alien abduction as a metaphor for slavery; the influence of African cosmologies and science; the divine feminine; time travel; space exploration; and community engagement. There are also chapters devoted to music, literature, and the visual arts. The result is an abundance of images and names packed into a fairly slim volume. While this means that Womack doesn't always analyze individual works very deeply, the archive she illuminates is worth the price. There are enough stars in Afrofuturism 's galaxy of artists to keep the interested explorer traveling for years. This is really a comment on the present, on the world we know, but it's written in a way that demands a future: art is in the future; art is what comes after the space that must be created in order to make it possible. The urgency—one "has to" create both space and art, in order "to think freely and creatively"—flows from both the present and the past. It flows from opposition to the "rotated images" that fill the world, images that make the black past and present seem irreparably damaged, and the future impossible. While pessimism is not the prerogative of any one group, it has a particular hold on Africa and the African diaspora. As the sociologist Alondra Nelson tells Womack: "There's something about racism that has produced a fatalism that has impacted futuristic thinking" (p. 41). Nelson explains that this fatalism is countered by black prophetic traditions, and it's interesting to see Afrofuturism in that context: as a mode of futuristic thinking that draws on spiritual understanding and practices, and adds an emphasis on the power of technology. The idea works especially well when it comes to music. Afrofuturism's blend of past and future, the technological and the spiritual, can be seen in Sun Ra's appropriation of the name of an Egyptian deity and desire to use electronic music to heal, and George Clinton and Parliament/Funkadelic's concept of funk as a cosmic energy tapped by musical instruments. Clinton's Mothership, Womack writes, "became a bridge between a missing African past and a glorious space-age future" (p. 63). Afrofuturism doesn't reject the past and present in favor of the future, but seeks to remix historical elements, such as those drawn from African religions, in order to energize futuristic thought. "The approach is not limited to a certain style of music," composer and trumpet player Leon Q. Allen says of Afrofuturistic music: "the approach is based on the desire" (p. 56). Afrofuturism, in its orientation toward what Allen calls "the 'what next' factor" (p. 56), can be read as a practice of cultural desire. Womack's project is Afrofuturistic in its own right. Like the artists she studies, she is "recontextualizing the past in a way that changes the present and the future" (p. 158). Afrofuturism becomes legible as she reads it. Womack is not, of course, the only one discussing Afrofuturism, but by covering so much ground, she makes the aesthetic stand out with particular clarity. Along the way, she reflects on the concept of transhumanism, considers the legacy of Star Trek 's Lieutenant Uhura, and celebrates black geek culture with infectious enthusiasm. Her informative and engaging primer is likely to become a standard text of the field it recognizes and reveals.